Those are all very interesting numbers in themselves, and we could spend quite some time going over those. However, what’s missing from the report’s breakdown of events is one incredibly important number, and it relates to the killer committing suicide: many of the killers commit suicide only when confronted with force, as we saw in the Newton shooting. What I would very much like to see is how many of the attackers who committed suicide prior to the arrival of LE killed themselves because someone fought back? That’s a very important number. Today though I want to focus on these numbers and how they apply to the average CCW permit holder. While I know that 100+ events is not statistically significant (sorry stats professor) it’s all we have to go on. So let’s look at the number that generated the title of this post: 16% of mass shootings are stopped by civilians. Let’s accept for the moment that the odds of being involved in an active shooter incident are relatively rare; with that being said we don’t carry our guns because we’re optimists. But if it happens, citizens, and armed citizens can stop them. Think about that for a moment. We’re not talking about some rambo’d up fantasy hero, but average citizens who are in the right place with the courage to act. I want you to do a little exercise. Set a timer on your watch for 180 seconds. Start the timer and stare at the blank wall until it stops. That’s how long the average active shooter has to roam free before police even arrive. 180 seconds is a LONG time. I actually quite like the guidelines espoused by the .gov for civilians in active shooter situations: run, hide, fight. It’s a good hierarchy, and we’ll use that now to create a simple set of guidelines to be better prepared for an active shooter situation. Be aware of your surroundings. Know where the exits are, and if you’re on foot or inside a building (like a mall) know where your vehicle is in relation to where you may be exiting the building. If you have other people with you, know their capabilities. Your wife dragged you shopping with her mother, can your mother-in-law run if she needs to? Do you have small children that will need to be carried? Best know these answers in advance. Escape is always the best plan. A big part of “Run” is being prepared to skip straight to “Fight” if you should find your primary exit blocked by an active shooter. However, if you can’t Run and don’t need to fight yet, we’ll move to the next item. Since you’re aware of your surroundings, you already know where a good hiding place is. A “good” spot is one that gives you the best visibility out possible while minimizing your visibility. So if you happen to be shopping at a store that specializes in 12 inch thick bulletproof glass, you’re in good shape. Otherwise, you’ll need to find a balance of concealment and visibility. Don’t be afraid to do things that are socially taboo: activate fire alarms, drop security gates, etc. This is your life at stake. Know the difference between cover and concealment. Cover stops bullets. Concealment just hides you from prying eyes. A good hiding spot would do both. But what if while you’re running, the active shooter spots you? Or you spot him? What if he finds your hiding spot? Then you have no choice, it’s time to fight. Be willing to fight. The military trains people in such a way so that when they’re presented with the time to pull the trigger, they don’t hesitate and are able to do their job. A civilian can do that same mental training by preparing your mind for the eventuality of the fight. We harp on this all the time: make your choice now. Write it down, rehearse it in your mind. You should be able to visualize the circumstances under which you’re willing to use force right now, when you’re quiet and calm. I don’t mean this in some kind of daydream fantasy mode either, but a serious mental decision to not be a victim. Be able to fight effectively. Get training. Be confident in your skills. If there’s an active shooter 20 yards away with a rifle pointed at you, can you make that shot with a handgun? I guarantee if you can’t make it on the range, you won’t when it’s for real. Be ready for the consequences. You may fail and get killed. Do you have life insurance for your family? You may succeed and then get sued by the family of the shooter, do you have a good lawyer? There are so many things that could go wrong in a situation like that; but when you’re behind your gun isn’t the time to be thinking of them. That needs to be squared away today, before the fight could ever happen. It’s a grim reality that active shooter situations are on the rise. The mainstream media has practically printed a blueprint for every broken anti-social loser to get all the attention they could ever want. Make no mistake that the constant media glorification is the reason for the rise in these incidents. Because they’re on the rise though, we have to be prepared. If you’ve been putting off taking that training class, now’s the time. No year like this one. Does IDPA reward accuracy more than USPSA? So now we need this As part of the state of the union address! Very good information need to share. Another interesting piece of information would involve how many of these “active shooter” events took place in a non-permissive environment–i.e. 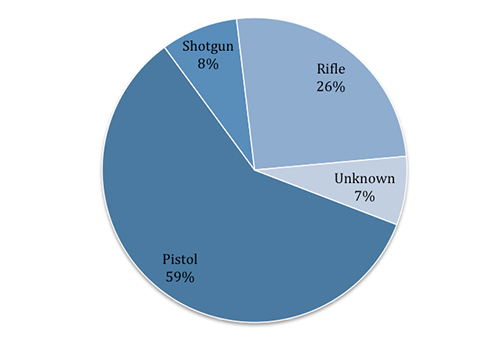 no guns zone–compared to how many were stopped by armed civilians. Since armed civilians are not supposed to be in no gun zones then I would expect their to be far fewer examples in the statistics than if the event took place in a “permissive” envirnoment. All mass shootings in the last 3 years (I’m only sure of those years but I’m sure you can go back 10years and have an almost perfect record here) have occurred in gun-free zones. The ones that were stopped before they became mass shootings, like the Oregon mall, occurred in permissive zones. The active shooters that end up killing themselves or being killed by a good guy did not become “mass shootings”. Is the reason no one really talks about the Pearl HS shooting where only two students died before the assistant principal retrieved his gun from his car and stopped the shooter. This shooting might have been LESS severe if that man had been conceal carrying as he used to before his school became gun-free. The shootings that are stopped are never mass shootings because they only count 5 or more dead as such. Gun-Free Zones DON’T work. Period. If they did we wouldn’t even be talking about this because the mere presence of that sign and law would deter the shooter who would go somewhere else where he could carry his gun. It sounds stupid because it is. Drugs are illegal, we still have people selling crack and cocaine in the streets, this is what people that espouse feel good legislation like GFZ legislation chose to ignore. The FBI study Caleb mentions covers “active shooters” not “mass shootings”. The definition the FBI uses for incidents studied is; “an individual actively engaged in killing or attempting to kill people in a confined and populated area, typically through the use of firearms.” They do not exclude incidents where less than 5 people are killed. What this doesn’t consider is how many “mass shootings” are stopped by armed citizens before they become “mass shootings”. Or how many incidents were avoided because a would be shooter saw an armed citizen, i.e. Open Carry. I’d be willing to bet a considerable amount of money that Open Carry has never deterred a mass shooting. How do you propose to accurately determine if a mass shooting has been deterred? With the sheer number of surveillance cameras monitoring malls, schools and other public spaces these days — and the fine-toothed comb and microscope treatment being given to nutjob shooters after their crimes — it should be a simple matter to find evidence of a shooter who had been scouting out a locale and was scared off by someone carrying openly. What? That’s never happened, even once? What’s that? Open-carry nuts are useless exhibitionists? The real challenge to your wager is *proving* that a mass shooting did not occur in the first place. Then to prove that the intended shooter stopped because he saw someone with a gun. It will not meet your wager, but I will ask how many shooters attempted to attack a police station, or a gun range? Places where people are known to have guns? How many people were injured before the shooter was stopped? On the flip side, how many shootings occur in purported “Gun-Free Zones”? What caused the shooter to stop? Chris Kyle was killed on a gun range. Mental instability makes no concessions for open carry. in response to my question about shooter attacking police stations or gun ranges, Evulgenious pointed out that former Navy Seal “Chris Kyle was killed at a gun range.” True, and there have been other murders and even suicides on gun ranges AND at Police Stations. The conversation here centers around “Mass Shootings” which is generally defined as an attempt to shoot 4 or more (Random) people. So allow me to be more precise in my counter challenge to Calab’s wager that OPEN CARRY has not prevented mass shootings. How many times over the past 20(?) years has America seen an attempted Mass Shooting occur at a Police Station, Gun Shop, Shooting Range or other venue where there is a high probability of the intended victims carrying firearms? I am honestly looking for real events, no matter how they ended. Potential victims who plead for mercy from an active killer only spur him to greater violence and likely doom themselves, while those who act aggressively against him have the best chance of stopping his slaughter, according to an exploration of the dark psychology of rapid mass murderers by a NYPD firearms trainer. Lt. Daniel Modell, training coordinator with that department’s Firearms and Tactics Section, is a rarity in the police world: a 19-year veteran cop with bachelor’s and master’s degrees in philosophy. He’s also a graduate of the Force Science certification course. In a paper published recently in the journal Law Enforcement Executive Forum, Modell expresses his theories on the subculture and pathological mentality of active killers, distinguishing their differences from others who commit multiple murders, challenging myths about their nature and motivations, explaining their copy-cat competition with other active killers, and suggesting tactics most likely to work against them for officers or civilians. “[T]he explanations [of active killers] most often proposed are plainly inadequate,” Modell writes. He argues that these individuals are not driven by the same dark forces as serial killers or murderous ideologues, nor are they motivated by vengeance or a sudden “snapping” in a moment of insanity, as is commonly believed. Their “bloodlust signals a more savage pathology,” he asserts. Over the course of a lifetime, the active shooter has “consistently [and] chronically” been a victim, developing “a self-contempt immeasurable by rational standards,” Modell writes. In the active shooting, his one, all-absorbing moment of glory, the offender feels himself transformed temporarily into a victimizer. When he sees his victims fleeing in terror, crying, cringing, pleading, “yielding without resistance–as he always has, he sees in their faces, their postures, their bearing everything that he has ever been…. In killing them, he kills himself…kills the failure and the loathing.” Potential victims who act like victims invite his lethal contempt. In Modell’s words, “[H]e is conditioned by a lifetime of conceding, cringing, and yielding. Swift, aggressive action exploits [this] conditioned behavior. In his brief role as victimizer, he will attack a victim; he will not attack–not effectively, in any case–those who adopt the posture and action of victimizers in his peculiar interpretation of that term.” Most, when the prospect of confrontation occurs or seems inevitable, commit suicide, he notes; those who don’t, want to. The bottom line for law enforcement, Modell concludes, is to “respond and engage the killer without delay,” employing solo-officer entry and search if necessary, rather than the “affected orthodoxy of cumbersome team formations.” For civilians, “when necessity or obligation calls, attack”; tackling the suspect has been enough in a number of instances. To access a free abstract of Modell’s article, “The Psychology of the Active Killer,” click here https://www.iletsbei.com/forum/articledetail.php?recordID=1415, where the full text can be purchased for $4 as well. Do you have facts/stats/evidence to back this up? From other sources I have read they’re actually on the decline. If you have references for that assertion I would appreciated hearing about them. The linked FBI study shows that active shooter incidents are on the increase. I was thinking more of an independent study – not a group that is heavily invested in the issue in question. How is the FBI not independent? I think I will leave it there. Not everything is a big conspiracy by the President. Sigh, I didn’t say everything is a big conspiracy by the President. I’m not even American. But if you think that the FBI, with all the revelations exposing government agencies for their dishonesty over the past few years, are independent you’re even crazier than this loon that you just tried to belittle with your stupid little “sigh” comment. It undoes everything you’re saying as it is preposterous. An actual study by the FBI shows active shooter incidents are on the rise. What studies do you have that show otherwise? I’d be willing to accept the argument that the entire study is flawed and none of the data is usable, but not this piecemeal nonsense. I do encourage you to click through and actually read the FBI’s abstract in its entirety. I don’t have studies, which is why I asked you where you got your data from. If it’s only the FBI study then I would ask if there are any academic studies that support their data too. I’m not jumping on any bandwagon or getting “excited” all I can say is that personally, my choice, I don’t trust the FBI, their data or their conclusions. I think the study was interesting and that could lead to, hopefully, more research which would give us more trustworthy information but more than that? No thanks.